They are part of the GroupM media group and have domestic and international clients generating global billings of over $20 billion. MEC values are to do with being innovative and ambitious and their visual style is unconventional. 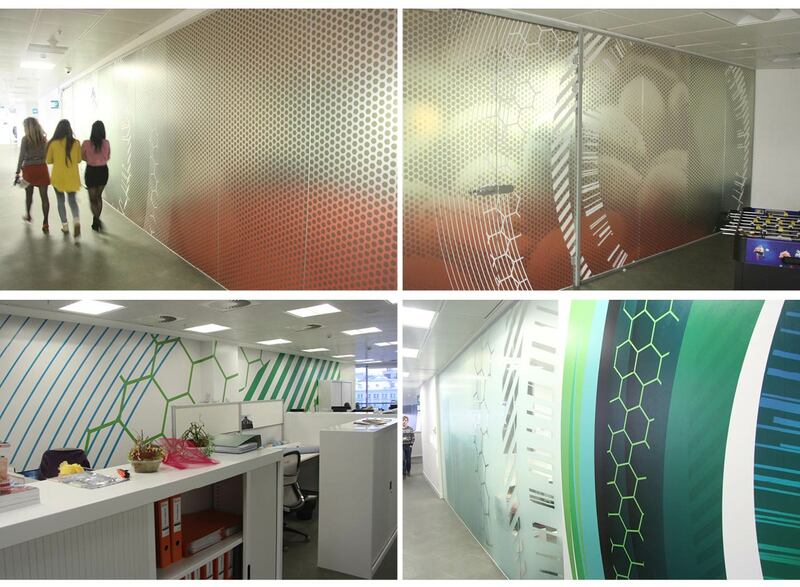 Our brief was to create a workplace graphics scheme for their Moscow headquarters which reflects the company values and personality and brings them to life within the physical environment. The office occupies one entire floor of a modern office block in Moscow. Four other floors within the same building are occupied by four other GroupM companies. Our work with MEC was part of a larger project which involved designing workplace graphics schemes for each of those other companies. The emphasis was on creating differentiation by reflecting the individual personalities of each company within the group. At the time of the project, MEC had just completed a rebrand, featuring a brand new graphic identity. This was one of the first opportunities anywhere in the world to reflect that new identity within the physical environment. We used graphic elements from the new branding to create a textural, multi-layered graphic approach throughout the main office and workplace areas, and contrasted that throughout the breakout and leisure areas through the use of framed individual ‘character’ style photos of the MEC team, blurred motion city images and a warm, colourful MEC café.